Once upon a time, a powerful Sinhalese king felt a sudden pang of anxiety. He couldn’t understand why, because he had everything any man could desire. With his fervent will to survive and insatiable thirst for power, he had single handedly assassinated his father, King Dhatusena, chased off his brother, Mogallan- the rightful heir to the throne, and he had taken the island country of Sri Lanka as his own. But, his acts were shrouded in evil, and when you are evil- you become anxious and you become paranoid. It is a curse, because though you succeed, you are haunted by your black acts and they gnaw at your brain like toxic parasites until you lose your beautiful mind. He knew his brother was still alive; he knew Mogallan would be back for revenge. King Kassapa I took a quiet moment out of his royal life in the traditional Sri Lankan capital, Anuradhapura, and he thought about his exotic land, the pearl of the Indian Ocean. Kings come and kings go on this chameleon island, leaving behind a fantastic history, with colors as deep and ever-changing as a mood ring. But, this king, he was determined. He was intelligent and imaginative. He did not believe his rule would end, as if he would ever let such a ridiculous fate come to be. And so, he gathered his most trusted advisers, engineers and mathematicians, and he began to plan. He would move the capital city to the jungles of central Sri Lanka, to a sturdy rock. Brown, calloused hands lifting and sifting, pulling and pushing, climbing and hammering and painting under the hot Ceylon sun. Sigiriya Rock would became a sacred haven, a dazzling pleasure palace and intrepid fortress unlike any the world had ever seen. 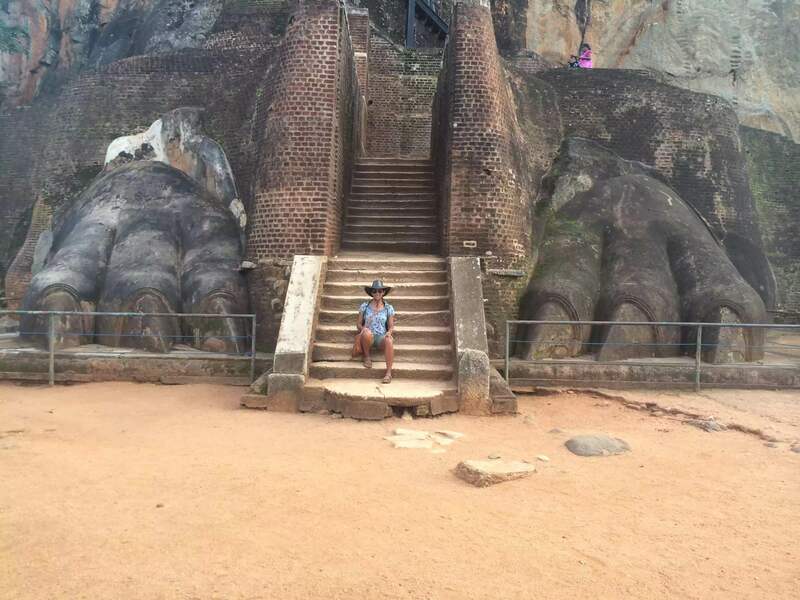 My friend Pazi from Hiking Sri Lanka and I had just hopped off the local bus on our way to climb Sigiriya, or Lion Rock. It was a sweltering November day as we embarked through the central Matale District near the town of Dambulla to explore this World UNESCO Heritage site. What a mind boggling place. We stopped for a coconut and I peeped above the thick foliage to where the great rock painted the sky. You can see the damn thing from miles around- a trapped beast dominating the relentless jungle from North, East, South and West. Its skin is flushed copper and milk, its granite spine protruding into pristine blue. 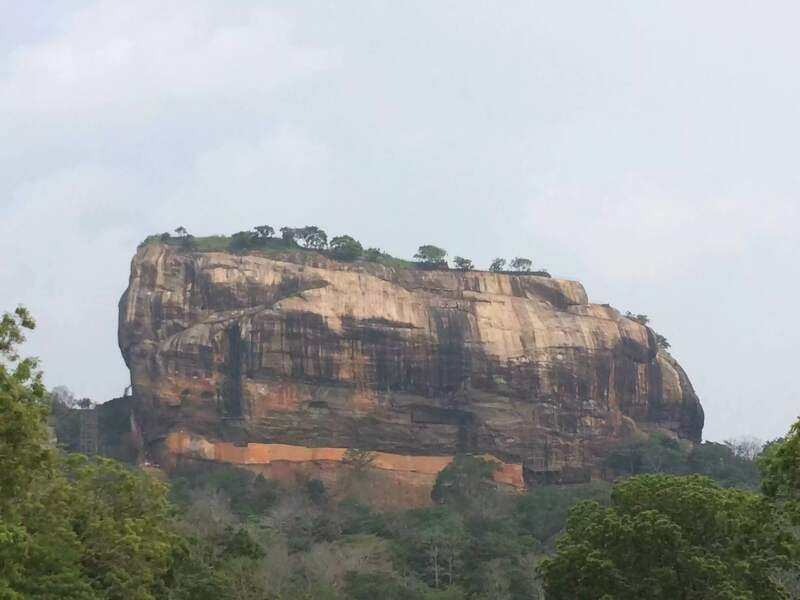 But, what really sets Sigiriya Rock apart from any place in the world, is the tale of its legacy: the horrors and grandeur events it witnessed centuries ago. There is a certain eeriness here; deep rooted, dark wisps of betrayal and murder, the stench of greed and the lingering remnants of arrogance and unspeakable wealth. Towering, steep sides and a long, flat top allow for the perfect fortified chamber, and Kassapa I knew this. He moved the Sri Lankan capital from Anuradhapura in 477 CE and turned the monstrous plateau into a seemingly impenetrable kingdom. It was meticulously planned and laid out. When you arrive, you notice the long, rectangular pools, filled with white and purple lotus. Green mossy steps and gardens welcome visitors, with the Lion Rock looming ahead. Walk the path through the West side of the capital city, past crumbling columns, temples and withered water gardens; where bustling markets and shops once stood in another time. Then, you begin to climb the rock, step by step, and you run your fingers along the cool granite surface and imagine what it was like to call this stunning place home. “Here, I will feel infinite peace,” the nervous king reassured himself. And he focused his deep seeded anxiety into creating an architectural masterpiece. Day in and day out, this lonely rock in the middle of the jungle was turned into a bustling metropolis, a marvel that would stand the test of time. Artists clung to the rock’s sides, illuminating the drab walls with bright frescoes of wanton feminine faces, supple breasts and soft stares meant only for you. Painted hands extend, cradling tropical flowers and fruits, beckoning visitors through rock corridors to the mirror wall. It is slathered in thick coats of polished white plaster that shimmer so brightly, the king can see his reflection as he navigates the deep cut paths and steps of his spectacular abode. Climbing still, Pazi and I are halfway up to the palace. We stop in front of a crooked grand staircase, flanked by two massive feline paws. 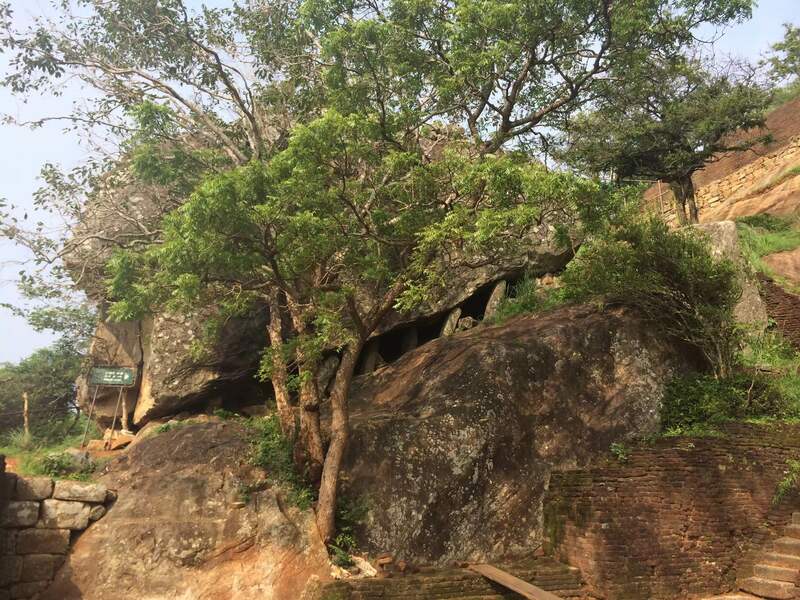 It is the entrance to the top, where the royals lived and played with all of Sri Lanka spread for miles around them. This is an infamous gateway. This side of the rock had been carved into the shape of an enormous lion. Visitors climbed up the stairs into the gaping jaws, and through the cat’s throat to reach the magnificent plateau. Now, only the paws remain. Finally, we reach the top. Pulling myself onto the rock’s flat shelf, I stand and gaze about. You can see clear across the country for 360 degrees. “From here, I can see any advancing attack,” thought the King, a smug smile on his arrogant face. He turned and surveyed his new palace. Deep, long baths filled with clean water and elaborate rooms and gardens covered the flat plateau. The city below was an ant hill overshadowed by large, deadly boulders teetering on cliff edges. They were strategically placed and held up by thick logs, ready to be released upon the enemy at any moment. Despite the tropical heat, a light breeze calmed the king, and he was a god on top of the world. Pazi and I spent some time on top of Sigiriya. The baths are still there, filled with green water. 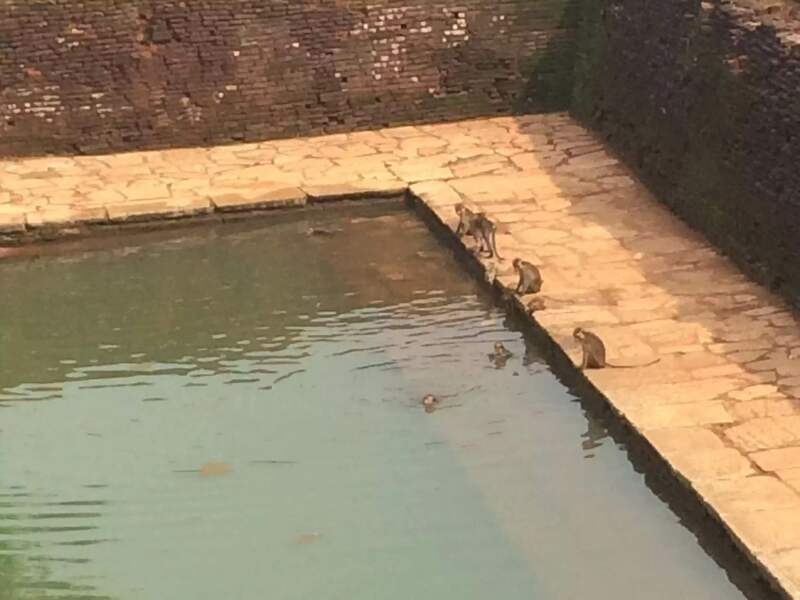 A band of monkeys scampered amongst the palace ruins. A few of the babies dove in and out of the biggest pool while protective mothers watched from the water’s edge. I had no idea that monkeys could swim so well. They were jungle mermaids, diving deep and disappearing beneath the emerald murk before resurfacing seconds later in a different spot. I shook my head as I gazed out past the plains and wild jungle into distant cities, my imagination bursting at the seams. How can such a small island be packed with so much history, ancient tales, sacred hideaways and mysterious secrets? A scream so shrill it could turn blood to dust and shrivel veins erupted deep from the throat of King Kassapa’s battle elephant. It was 495 CE, and Mogallan had indeed returned with a vengeance. Amidst the throes of a bloody battle for the throne, King Kassapa made a decision that would change his fate. Taking matters into his own hands, he urged his elephant in a much different charge than his army had anticipated. Confused and perceiving the impulsive move as a retreat, the King’s army abandoned him, and Sigiriya was in the clutches of his brother, the rightful King of Sri Lanka. Kassapa would never admit defeat, his pride was too great. Unsheathing his pointed dagger, he held the glinting blade up to the sun, and in one fluid movement, slashed his own throat. 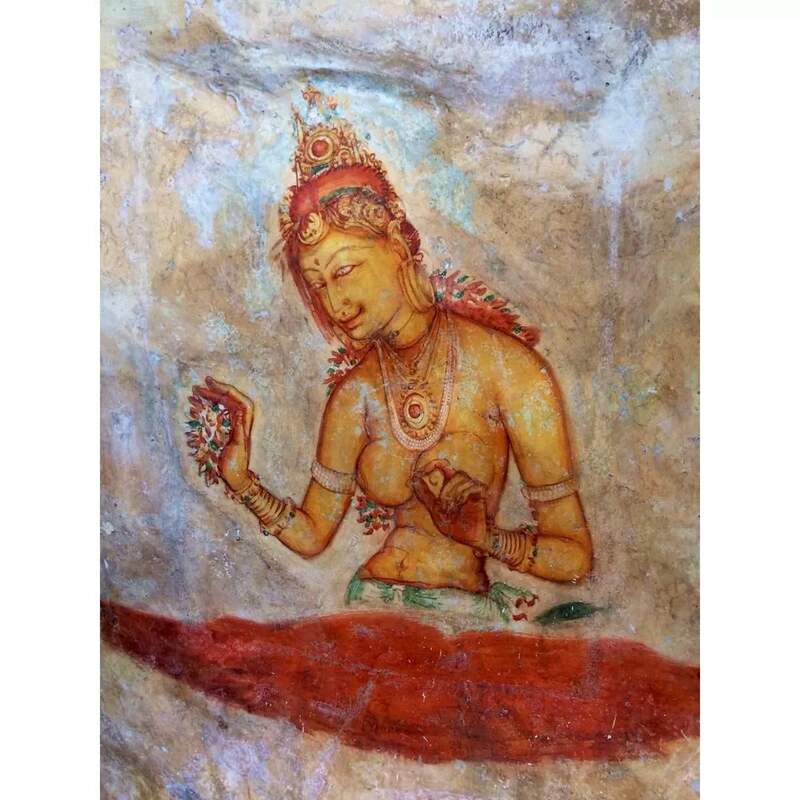 *This historical information in this post is taken from the Chulavamsa, a Sri Lankan historical account compiled by Buddhist monks, which covers the 4th century to 1815. This article makes me want to return to the motherland,just to be there again..beautiful!